Crimson Peak, the new film by Guillermo del Toro, (Pan’s Labyrinth, Hellboy) feels like it has been lifted straight out of a gothic horror novel. Taking a page from Mary Shelley’s Frankenstein, or Nosferatu, every frame of Crimson Peak overflows with a romantic longing for early 19th century horror. Starring Mia Wasikowska, Tom Hiddleston and Jessica Chastain, the film tells the story of writer Edith (Wasikowska) as she moves away from her native home in Buffalo after her father mysteriously passes. Edith grew up believing in ghosts, and has the unique gift to communicate with them on occasion. 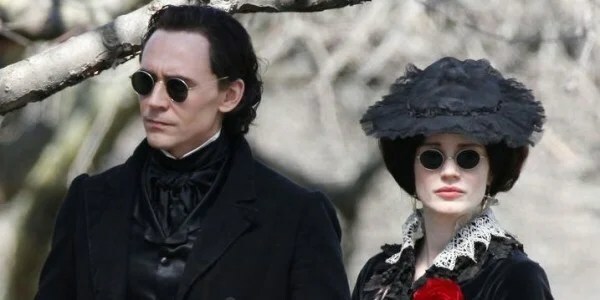 This gift turns into a curse when these apparitions visit more often in a home inhabited by her new husband Thomas Sharpe (Hiddleston) and his sister Lucille (Chastain). Soon, Edith learns a frightening revelation about her new husband and sister in law, one that might prove deadly. Del Toro has always been one to impress when it comes to production design. A true escapist director, his films always find a way to immerse viewers into their immaculate and delicately crafted worlds. Crimson Peak is no exception; everything from the costumes to the soundtrack to the carefully-pronounciated english dialogue indulges into a romanticized gothic fantasy (nightmare?) that shows del Toro’s directorial skill and passion about the subject matter. Unfortunately, the pacing is just too sluggish and the plot developments tediously follow a familiar path. As a film that is both thematically and literally engulfed in darkness, Crimson Peak is surprisingly spook-less, barely registering enough jump scares to call itself a “horror” film. Instead, del Toro opts to build tension out of the mystery rather than terror. But the mystery absolves itself a bit too slowly (and predictably) leaving little behind but the beautiful visuals and an overuse of graphic violence to hold the audience’s attention. Bottom Line: With a spooky atmosphere and a gorgeous production design, Crimson Peak is a visually stunning mystery that unfortunately arrives a little shy on both scares and suspense. Tom Hiddleston and Jessica Chastain. Not looking suspicious at all.